Cheap Personalized Dentist Crayons in Bulk. Promotional, Non-toxic, Washable. Bulk promotional dentist crayons at the lowest prices in USA and Canada. Each personalized crayons box contains 4 quality, non-toxic, washable crayons, safe for children: Red, Yellow, Blue and Green. We also supply blank (not imprinted) wholesale crayons at a lower price: contact us. The box of crayons displays a stock full-color, dental-theme image on one side and your custom imprint, plus a stock border on the other side: see picture. Free artwork design. We will send you a proof for your approval before production. American clients pay no taxes. Prices below include your 1-color custom imprint on one side. Setup Charge is $45.00 per color. Add $0.12 foe each extra imprint color, as shown. Production Time: 10 days after art approval. Rush production of 3 and 5 days is available: contact us. 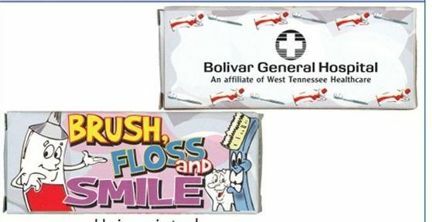 Imprinting Area: 2.00" x 1.00" custom imprint on one side; dental theme image on the other side: see picture. Production Time: 10 days. Rush production of 3 and 5 days is available: contact us.